HALIFAX, N.S. 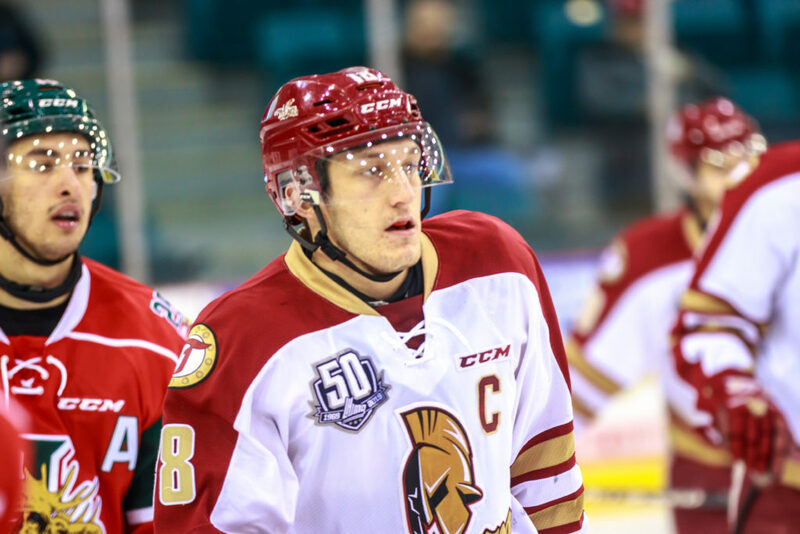 – After their original meeting scheduled for Friday night was postponed due to bad weather in Northern New Brunswick that kept the Titan from travelling to Halifax, the Acadie-Bathurst Titan and the Halifax Mooseheads faced off in a rare Monday night affair. It was the visitors who drew first blood however the Mooseheads took control and never looked back. Mathieu Desgagnes potted his ninth of the season at 9:12 to give Bathurst a 1-0 lead. Evan MacKinnon and Liam Leonard picked up the assists on the first goal of the game. Samuel Asselin tied it up 1-1 on the powerplay at 12:07 against his former team. Xavier Parent and Patrick Kyte would score later in the opening period to give the Mooseheads a 3-1 lead after one period of play. No goals were scored in the second period so the score remained 3-1 going into the final 20 minutes. Halifax would widen the gap in the third as Arnaud Durandeau scored twice including a powerplay tally and another former Titan Antoine Morand added a goal to give the Memorial Cup hosts a 6-1 victory.